Tavan, F., Sajadi, S. (2015). Determination of optimum of production rate of network failure prone manufacturing systems with perishable items using discrete event simulation and Taguchi design of experiment. Journal of Industrial Engineering and Management Studies, 2(1), 16-26. F. Tavan; S.M. Sajadi. "Determination of optimum of production rate of network failure prone manufacturing systems with perishable items using discrete event simulation and Taguchi design of experiment". 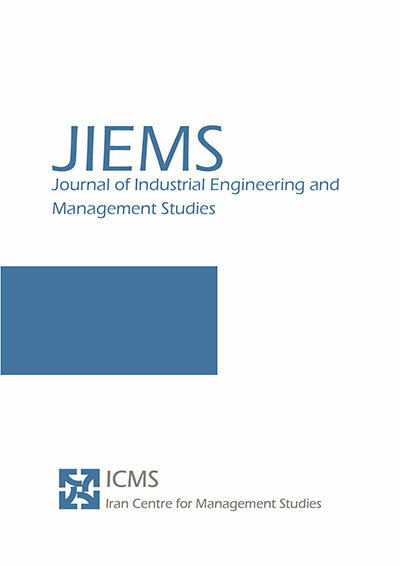 Journal of Industrial Engineering and Management Studies, 2, 1, 2015, 16-26. Tavan, F., Sajadi, S. (2015). 'Determination of optimum of production rate of network failure prone manufacturing systems with perishable items using discrete event simulation and Taguchi design of experiment', Journal of Industrial Engineering and Management Studies, 2(1), pp. 16-26. Tavan, F., Sajadi, S. Determination of optimum of production rate of network failure prone manufacturing systems with perishable items using discrete event simulation and Taguchi design of experiment. Journal of Industrial Engineering and Management Studies, 2015; 2(1): 16-26. 1Islamic Azad University, Najafabad, Iran. 2University of Tehran, Tehran, Iran. This paper, considers Network Failure Manufacturing System (NFPMS) and production control policy of unreliable multi-machines, multi-products with perishable items. The production control policy is based on the Hedging Point Policy (HPP). The important point in the simulation of this system is assumed that the customers who receive perishable item are placed in priority queue of the customers who are faced with shortage. The main goal of this paper is determining of optimal production rates that minimizes average total cost consist of shortage, production, holding and perishable costs. Because of uncertainly and complexity of this system, simulation optimization of this system using ARENA software has been done. A numerical example will show the efficiency of the proposed approach. Akella, R. Kumar, PR. 1986. “ Optimal control of production rate in a failure prone manufacturing system, IEEE Transactions on Automatic Control, 31: 116–126. Chen, Y.H. Tam, SC., Chen, W.L., Zheng, H.Y., 1996. “Application of Taguchi method in the optimization of laser micro-engraving of photo masks”, Int J Mater Prod Technol, 11: 333–344. Fatemi Ghomi, M., 2010. “Production Planning and Inventory Control”, 7th ed. Tehran, Iran. Gharbi, A. Kenne´, JP., 2000. “Production and preventive maintenance rates control for a manufacturing system: an experimental design approach”, International Journal of Production Economics, 65: 275–287. Kenne´, JP. Gharbi, A., 2000. “Production planning problem in manufacturing systems with general failure and repair time distributions”, Production Planning & Control, 6: 581–588. Kimemia, JG., 1982. “Hierarchical control of production in flexible manufacturing systems”, PhD thesis, Massachusetts Institute of Technology, Dept. of Electrical Engineering and Computer Science. Mandal, N. Doloi, B. Mondal, B. Das, R., 2011. “Optimization of flank wear using Zirconia Toughened Alumina (ZTA) cutting tool: Taguchi method and Regression analysis”, Measurement, 44: 2149–2155. Older, GJ. Suri, R., 1980. “Time operational part-routing in manufacturing system with failure prone machines In: Proc. 19th conf. decis. Control, Albuquerque, NW. Ping Lee ,Yu., Yuan Dye, C., 2012 “An inventory model for deteriorating items under stock-dependent demand and controllable deterioration rate”, Computers & Industrial Engineering, 63: 474–482. Pochet Y, Wolsey LA; 2006. “Production planning by mixed integer programming”. Secaucus, NJ, USA: Springer-Verlag New York, Inc; ISBN 978-0387299594, 500. Rishel, R., 1975. “Control of systems with jump Markov disturbances”, IEEE Trans Automat Contr 20:241–244. Saidi-Mehrabad, M. Paydar, M.M. Aalaei, A., 2013 “Production planning and worker training in dynamic manufacturing systems”, Journal of Manufacturing Systems, 32: 308– 314. Sajadi, S.M., 2011” Determination of production rate of network failure prone manufacturing system with constant demand”, PhD thesis, Amirkabir university, Dept. of Industrial Engineering. Sajadi, S.M. Seyed Esfahani, M.M. So¨ rensen, K., 2011” Production control in a failure-prone manufacturing network using discrete event simulation and automated response surface methodology, Int J Adv Manuf Technol 53: 35–46. Sivasakthivel, T. Murugesan, K. Thomas, H.R., 2014 “Optimization of operating parameters of ground source heat pump system for space heating and cooling by Taguchi method and utility concept”,Applied Energy, 116: 76–85. Xie, X.; 1989 “Optimal control in a failure prone manufacturing system”, Automatic Control, IEEE, 31:116-126.